Indian and South African cricket teams have donated about USD 8,500 for the supply of bottled water and drilling of borewells for the residents of drought-stricken Cape Town, which is facing the worst water crisis. 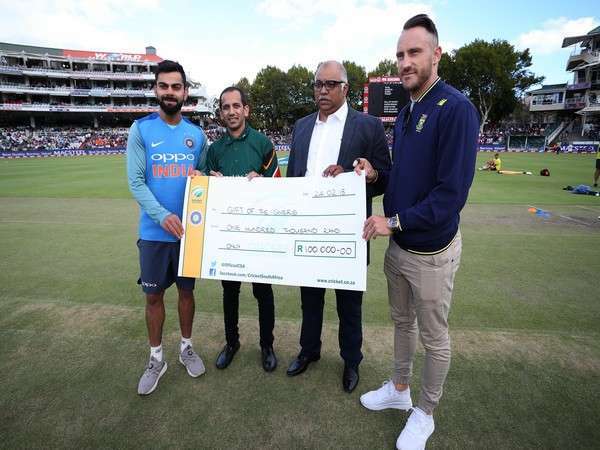 Indian captain Virat Kohli and his South African counterpart Faf du Plessis made the donation of 100,000 Rand to the Gift of the Givers Foundation at the third T20 International cricket match at the Newlands Stadium on Sunday. The Gift of the Givers Foundation is the largest disaster relief organisation of the African continent. Appreciating the move, Chairman of the Foundation, Imtiaz Sooliman said that the donation will be put to good use. "The Gift of the Givers appreciates the support from the South African and Indian cricket teams towards our Western Cape drought initiative. "The generous contribution will assist us in essential borewell drilling in various areas which are virtually without water," said Sooliman. Last month, residents of Cape Town were restricted to use just 50 litres of water per day, with Mayor Patricia de Lille announcing that the city had "reached a point of no return" which would see it reaching 'Day Zero' when all water in the city would run out, within just the next two months. "Both teams had the first-hand experience of the water crisis in Cape Town and, having a chat with Kohli, we decided to get the teams to sign some jerseys which we auctioned off, with the funds raised going to assist the Cape Town Water Crisis," said du Plessis. "We also wanted to create awareness and hope that other organisations and sports codes follow in our direction," he added. Stressing on the importance of getting involved in this campaign, Kohli said "Cape Town is one of the most beautiful cities in the world and whenever we visit and play at Newlands, we are treated extremely well by the local people. "By creating awareness of the drought, we are playing our part in highlighting the drought so people can see the seriousness of what is taking place in the Mother City.